These load cells are compatible with the LS Series test machines, the TA1 texture analyzer and the FT1 friction tester. These load cells are S-Beam designed with anti-rotation collars to keep the load train from twisting. 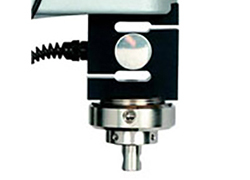 The YLC Series features easy adjustment for better axial alignment. The load cell accuracy is +/- 0.5% from 1% to 100% of the stated load cell range.